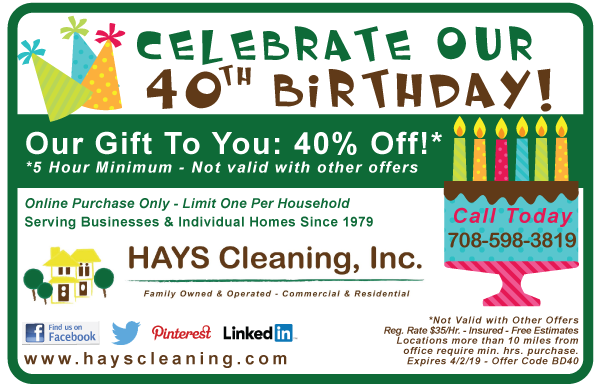 HAYS Cleaning celebrates 40 years but our customers get the gift! Our gift to you is 40% off of your cleaning. Purchase online by April 2, 2019. Must purchase by April 2, 2014 and schedule your cleaning by April 30, 2019. This entry was posted in Discounts, News, Promotions and tagged Chicago maid service, Chicagoland housecleaning, cleaning Hickory Hills, cleaning service Palos Hills, cleaning services Hickory Hills, HAYS Cleaning, HAYS Cleaning promotion, residential cleaning by HAYS Cleaning. Bookmark the permalink.